Today I am telling you about one most important reality in blogging sector. I think there are a lot of bloggers who are not serious about this factor and that is why bloggers fail at blogging. There are a lot of successful and popular bloggers in this area but most of the bloggers can not reach their goal. Many bloggers have already given up blogging for frustration. Don't worry friend, I only tell you about the reality because this incident is happening every day. You must not be worry because there are a lot of hopes in front of you. You should think about some successful bloggers, why you don't want to be one of them and you should know about why bloggers fail at blogging if you want to become a successful blogger. How does a successful blogger become popular and famous? You must be one of them if you are serious and continue your work in the right way. Successful people learn from their mistakes but unsuccessful people have no intention to do better if they have done any mistake. So I think you must try to overcome your mistakes if you want to be a successful person. But there are a few bloggers who able to make them successful and most of the bloggers can not do that because they don't know why bloggers fail at blogging. Here I tell you about why bloggers fail at blogging. You should conscious about why bloggers fail at blogging? I have found some reasons that make a blogger unsuccessful. Selecting the wrong niche is one of the biggest reasons why bloggers fail at blogging. You have to select your niche or topic from the beginning of your blogging journey. Niche is what you want to write and publish contents about it. There are a lot of bloggers who could not select perfect niche or topic for their blogs so they had to stop their blogging without any benefits. Some bloggers follow other bloggers when they select their topic/niche. But those bloggers should know one topic may be perfect for me but may not for others. Most of the unsuccessful bloggers select such topics which are not suitable for them because they have a little knowledge about those topics. We know that a little learning is a dangerous thing, it is true for blogging. Because if you have no basic knowledge about blogging and other related issues, you may harm your blog. It is a major reason why bloggers fail at blogging and that is the lack of basic knowledge. A blogger should have some basic knowledge about blogging related issues before starting blogging. A blogger must know how to use his/her blog's dashboard, SEO, and related issues, how to write contents and publish them after doing on page SEO, marketing strategies, social media knowledge and other related issues. Patience is one of the most important and effective qualities of a successful blogger. It is very powerful that can make you a successful blogger. We everybody knows "Patience is bitter, but its fruit is sweet. " But I see that most of the bloggers don't have this quality. Who have patience enough they will be a successful blogger. Lack of patience among the bloggers is a reason why bloggers fail at blogging. There no such good thing that has overnight success. If you think you can make your blog famous and popular within a day or month otherwise you will give up blogging, I think you should not wait for a month, you should stop blogging from this moment. Most of the bloggers do blogging for earning money. Because blogging has become a great source income. I also started blogging with the intention of money. But a blogger should not act like a greedy people. Because when you become too much greedy then you can do anything right or wrong for the money. It is one of the biggest mistakes that's why bloggers fail at blogging. 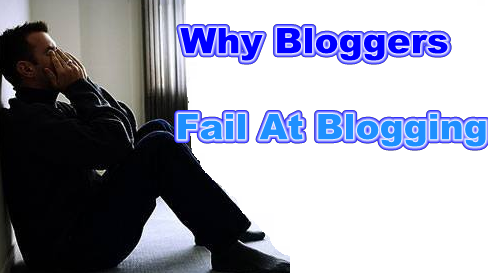 Before starting a blog you should think about why bloggers fail at blogging. Every successful blogger earns enough but at first, they had to make their blogs popular among the people. You must provide proper services to the readers by your blog otherwise, you will fail at blogging. If you want to get a quick result and want to earn huge money within a day with your blog, I think you will loose soon. You have to establish yourself as an authority then you think about money. Lack of consistency is a big reason that why bloggers fail at blogging. A blogger must have the consistency to do better, For want of consistency many bloggers have already failed to build a successful blogging career. You must know that lack of consistency is a major mistake why bloggers fail at blogging. Inconsistency leads a man to bad results. Bloggers must maintain consistency in publishing blog posts. Bloggers should keep a perfect schedule in publishing blog posts otherwise, they will lose their readers. Communication skills are very important for all the bloggers if they want to make their blogs successful. It is a perfect and effective skill for bloggers. There are a lot of bloggers who have no communication skills that's why bloggers fail at blogging. A Successful blogger always builds a connection with his readers. Only publishing contents are not your job, you also build a connection with your readers and other bloggers. Many bloggers do not communicate with his/her readers, followers, bloggers and this is a reason why bloggers fail at blogging. Here I have told you about why bloggers fail at blogging. Every blogger tries best to make his/her blog popular among the readers. But some bloggers can not reach their goal for some reasons. If you are a blogger, you must know why bloggers fail at blogging so that you can do that right thing.